I do believe that I had my very first Friend-Z yesterday. With the wonder that is DQ, and the wide variety of tasty Friendly sundaes already available, I've just never been in a hurry to try one of these things. Well I was in a literal hurry yesterday after returning some stuff, so I drove past a local scoop shop and pulled into Friendly's on the way back to work. Awhile back I had already decided I would start with a Kit Kat Friend-Z, so I placed my order, received it very quickly, and went on my way. Ok, the picture came out a bit red, but you get the idea: chocolate soft serve, big Kit Kat bits and a big tough spoon (like at Wendy's). First impression? The chocolate is... strong? I guess strong is the word. It just tastes, iunno, weird to me, like something isn't quite right. I don't want to call it bold or powerful because that implies I appreciated it's uniqueness. Maybe it's been too long since I had chocolate server... I guess the problem is I'm comparing it to the M&M twisted frosty I had a week or so ago, and frosties definitely have their own unique and more mellow flavor. Second Impression? These kit kat hunks are way too large. Sure, this depends highly on who made it, but this particular server left the bits quiet big. Zero kit kat flavor has been spread around my treat. 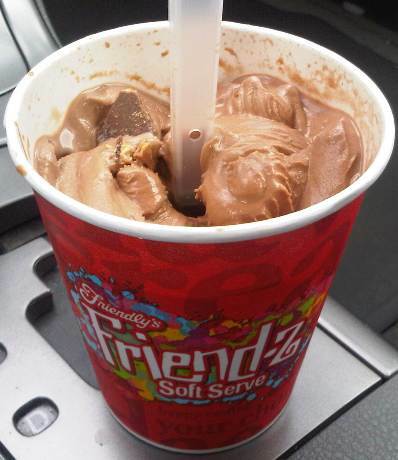 If I wanted boring, I could buy a cheap cone of soft serve and just have a kit kat on the side. Conclusion? Disappointment really. The concept is basic enough but this particular execution left much to be desired. Granted I choose to go with kit kats, but I wanted something different. Oh well, I'll probably just get a sundae next time.